First impressions do count. And your protagonist’s Characteristic Moment is his first chance to impress your readers. Now that we’ve got the basic theory of character arc out of the way and figured out how to set up your protagonist’s inner conflict, via the Lie He Believes, the Thing He Wants and the Thing He Needs, and the Ghost, we’re ready to officially begin writing our character’s story. 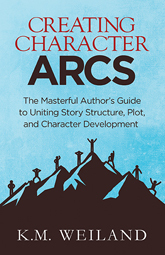 The structure of character arc begins with the Characteristic Moment. Throughout the rest of this series we’ll be aligning the major moments in the character arc with the major structural plot points. 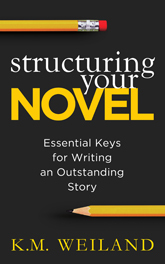 (If you’re unfamiliar with the basics of story structure, you may find my book Structuring Your Novel: Essential Keys for Writing an Outstanding Story a helpful foundation for what we’ll be discussing in the rest of this series.) The Characteristic Moment (and the Normal World, which we’ll discuss next week) align with the Hook. It shows up the moment your protagonist does—presumably in the first chapter. In real life, people may be cautioned against make snap decisions about others, based on first impressions. But, face it: we do. And we’re even less likely to feel conscientious about our judgments when reading fiction. We’ve just opened a book. We’ve never read this author before. We have no idea whether it’s going to live up to its awesome back-cover blurb and prove worthy of our time. Then here comes the protagonist, prancing onstage. What’s he doing? What’s his personality? Does he seem like someone we’re going to end up liking? Does he seem interesting? If not, we’re already halfway to closing the book. In short, a failed Characteristic Moment can very likely mean a failed story. (Probably) reveal your protagonist’s name. Indicate your protagonist’s gender, age, nationality, and possibly his occupation. Indicate his role in the story (i.e., that he is the protagonist). Demonstrate the prevailing aspect of his personality. Hook readers’ sympathy and/or their interest. Show the protagonist’s scene goal. Indicate the protagonist’s story goal. Demonstrate, or at least hint at, the protagonist’s Lie. Influence the plot, preferably directly, but at the very least in a way that foreshadows later events. Make the protagonist appealing to readers. You must establish identification with your hero before revealing major flaws that could reduce sympathy. If your character’s arc is all about him growing into courage, honesty, and selflessness, then he’s going to have to start out as less than brave, truthful, or generous. But if we tried to open most stories with a selfish, cowardly liar, most readers probably wouldn’t be hooked. And yet, what other kind of Characteristic Moment suggests itself for such a character? We have to indicate his problems, so we can prove how he’s changed by the end of the story, right? Absolutely. But our foremost job is hooking readers. If you intend your character to be generally likeable, despite his faults, start with that. What do you like about him? What scene can you craft to highlight that? He doesn’t even have to be nice in this scene; he just has to be interesting. Ron Clement and Jon Musker’s Treasure Planet opens with its rebellious teenage protagonist demonstrating his skills and courage aboard his “solar surfer.” Jon Turteltaub’s The Kidopens with its protagonist acting like a complete jerk, but his snide comments are so nasty (and accurate) that viewers can’t look away. Think big. If your character’s chief virtue is his compassion, don’t just settle for having him pat a stray dog. Have him run into NYC traffic just to cross the street and see why a little girl is crying. If he’s known for his bravado, don’t just have him strut down the street. Have him pick a fight with five toughs—and win (or nearly). Optimally, you’ll be able to work your character’s Lie right into the Characteristic Moment. But sometimes doing so just won’t be possible. We can only keep so many balls in the air while still maintaining logic within the plot. In these instances, you may have to postpone the introduction of the Lie until you’ve crossed off your list a few of your beginning’s other requirements. But you’re always going to want to introduce the Lie as quickly as possible. The Lie frames your character arc—and thus your entire story. Readers need to see proof of your character’s weakness, so they’ll understand what he has to overcome. What Is a Characteristic Moment? Note that some Characteristic Moments are double-sided. Thor’s Characteristic Moment takes place in a two-part series of scenes, the first of which is part of a prologue and shows him as a child. Just as with Treasure Planet, which also starts with a childhood prologue, the character has to be reestablished in his “true normal” as an adult with a second Characteristic Moment. In Jane Eyre and Toy Story, we see how we can use not just a single Characteristic Moment, but several to prove different aspects of our characters. Jane shows us two sides of her personality—first her lonely, but contented introversion, then her defiant and spirited refusal to be trampled upon. Because of the constraints of Toy Story’s logic, in which the toys must be passive and still when humans are present, Woody’s love for Andy is primarily shown through Andy’s love for him. This is the most important aspect of the story, but we’re also then given a prime example of Woody’s able leadership of the other toys, once he “wakes up” in Andy’s absence. A Christmas Carol by Charles Dickens: Scrooge is introduced in a lengthy “telling” segment (not recommended for modern books), in which the author flat-out tells readers certain important facts about Scrooge’s miserliness and general lack of the milk of human kindness. By the time we reach Scrooge’s first dramatized scene, we already have a pretty clear picture of his personality. That picture is further emphasized when we enter his frigid counting house (heated by a “very small fire” and his employee Bob Cratchit’s single coal) and proceeds to reject his nephew’s kindhearted Christmas invitation by telling him precisely what he thinks of the holiday and its goodwill toward men. Readers immediately get a sense of Scrooge’s crabby personality, his incisive wit, his Lie (which he basically spells out), and his story goal of making as much money as possible. Cars directed by John Lasseter: Lightning McQueen’s intro comes by way of his verbalized pre-race routine, in which he claims, “I am speed” and “I eat losers for breakfast.” He then demonstrates his sizable skills, as well as his disdain for his pit crew, in the lengthy race segment that opens the movies. Viewers are given further info, via the commentators, who reinforce Lightning’s Lie by revealing he’s already fired three pit crew chiefs because “he says he likes working alone.” In this extended opening, viewers learn all they need to know about Lightning: his good points (his racing skills), his Lie, and the Thing He Wants Most (the Piston Cup). 1. What important personality trait, virtue, or skill best sums up your protagonist? 2. How can you dramatize this trait to its fullest extent? 3. How can you dramatize this trait in a way that also introduces the plot? 4. How can you demonstrate your protagonist’s belief in his Lie? 5. Can you reveal or hint at his Ghost? 6. How can you use this scene to reveal your character’s overall story goal—the Thing He Wants Most? 7. Does your protagonist’s pursuit of both the story goal and the scene goal meet with an obvious obstacle (i.e., conflict)? 8. How can you share important details about your protagonist (name, age, physical appearance) quickly and unobtrusively? Don’t settle for anything less than spectacular for your Characteristic Moment. This is your opportunity to create a fun and effective scene that will introduce readers to your character in a way they’ll never forget—and won’t be able to look away from.